Blade, the on-demand transportation startup sometimes called "the Uber for helicopters", is offering a special service for users heading to the Coachella Valley Music and Arts Festival in April. For $695 a seat, the startup will be shuttling people from Van Nuys Airport to Palm Springs, close to where Coachella will be taking place. 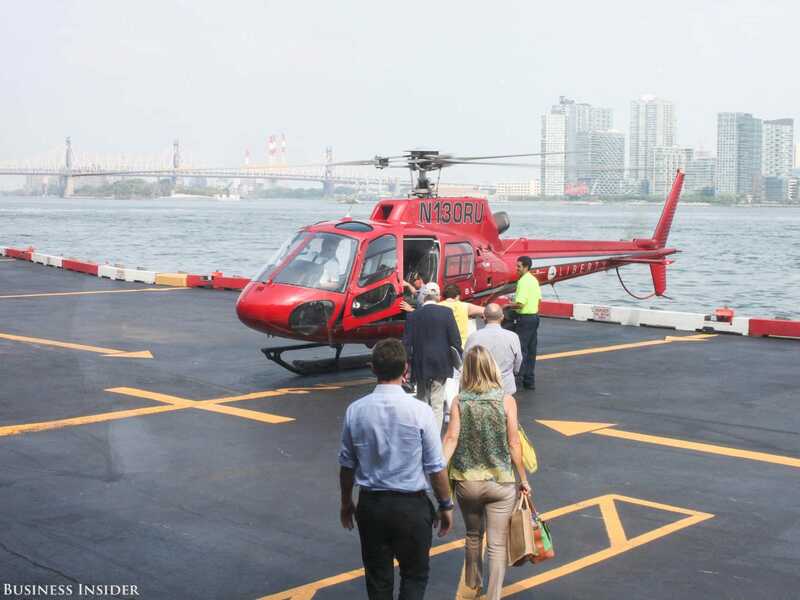 Users can also pay $4,170 to book an entire six-seat helicopter. The roughly 130-mile journey between Los Angeles and the Palm Springs area can take several hours in a car, depending on the severity of traffic. In 2015, a record-breaking total of 198,000 people attended Coachella, which takes place over two weekends in April. The helicopter flights, Blade's founder and CEO Rob Wiesenthal says, will take just 55 minutes. When guests arrive to Palm Springs, they can relax in Blade's exclusive lounge, where they can enjoy a full bar that includes George Clooney's Casa Amigos Tequila. Blade is also partnering with Uber to provide transportation to and from the Blade lounges at Van Nuys Airport and in Palm Springs. The price of the Uber SUV ride will be included in the $695 fee, and Uber drivers can take travelers' bags directly to their hotel if preferred. People wanting to try out the service can book their trips on both the Blade and Uber apps. Flights will be available starting March 25 through the end of Coachella April 24. This is Blade's first foray on the West Coast. "We believe that the West Coast is underserved by short-distance aviation — especially helicopter travel," Wiesenthal told Business Insider. "There is no better partner to explore the potential of this market than with Uber." Blade operates and manages the logistics of the helicopter flights it offers on its app; it doesn't own any aircraft. 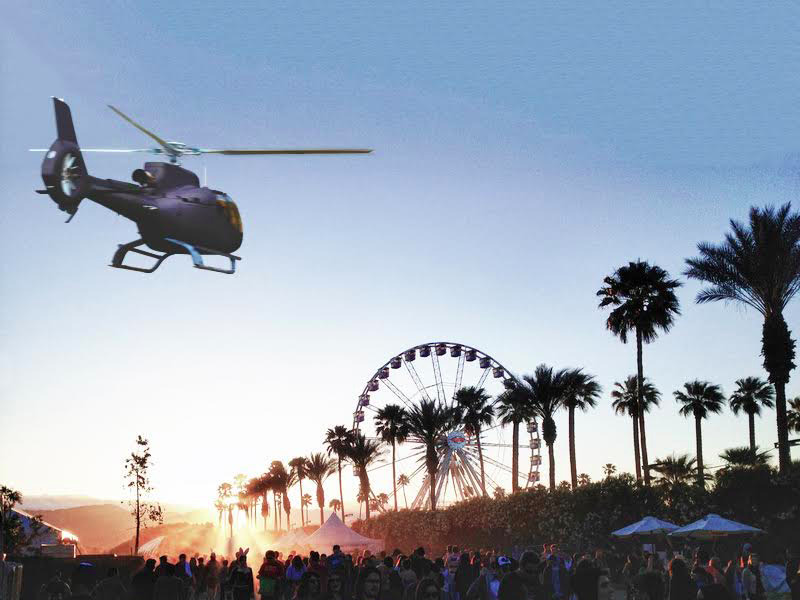 For Coachella, Blade will be offering seats on BELL EC-130 helicopters. The company started out offering flights between New York City and the Hamptons, and from Manhattan to area airports. It now also offers seats on private jet flights between New York and Miami through a service called BladeOne, as well as helicopter trips to Nantucket, Martha's Vineyard, and Cape Cod. A Blade flight leaves from a lounge in Manhattan. During the Sundance Film Festival in January, Blade offered helicopter service between Salt Lake City and Park City, but was asked to cease operations over concerns of disturbing the local elk population. The startup also recently helped coordinate speedboat trips between South Beach and the Ultra Music Festival in Miami, helping performers like Tiesto and deadmau5 make it backstage in time. Blade has raised venture capital from Google chairman Eric Schmidt, Discover Communications CEO David Zaslav, IAC's Barry Diller, Alex von Furstenberg, Raine Ventures, and iHeart Media chairman Bob Pittman. Both Pittman and Schmidt are licensed to fly helicopters and jets.